A Note from Chris Adams: Today, Dawn Stephens, Women’s Minister at The Church at Brook Hills, in Birmingham, Alabama challenges us to consider how we lead and live out our lives in front of those we lead. Do we live in a way that encourages others to be disciplined or not? Read and consider what you desire that others imitate about your leadership. I have been on a journey this past year that has affected the way I think about discipline in many areas of my life, including leading women. I started back to seminary last fall to complete a degree in Christian Education and the first book we read was, you guessed it, Spiritual Disciplines for the Christian Life by Donald Whitney. I can wholeheartedly recommend this book for all believers at any age and life stage. It was quite an encouraging book to me and one I will review again. At about the same time, I started a weight loss and healthy living plan facilitated by Weight Watchers that has given me tools to think about every bite I eat and adjust those to healthier options each day. But, in addition to those tools, I have a great group of friends on this same plan, facilitated by a Facebook group of encouragement, ideas, recipes, and tips each week. Are you becoming a leader who women would want to imitate in the disciplines in the faith? Our study of the Word, our prayer faithfulness, our time alone in solitude, our worship both personally and corporately, and our faith, along with other disciplines, contribute to a life of self-control and one that shows others that God is giving us the ability to die to self and live under His control. Also, our need for friends in community is vital to healthy living. Are you in community or are you isolated in work and ministry? When we allow this verse in Hebrews to live in our hearts, then we make choices that show “the Lord is my helper; I will not be afraid…” It gives us strength knowing Christ is right beside us helping us make healthy and sound choices that lead to godliness. Just recently I realized that I no longer desire the unhealthy things I used to want to eat, and I am making better choices in what I choose to eat. But, it has taken one full year for those habits and choices to start to lean toward healthier options. Now, I still can and do make poor choices, but they are fewer and hopefully I recognize them quicker and make adjustments. Be encouraged that it does take time (it may be different for each of us) for new habits, ways of thinking, and “go to” foods (aka choices, thoughts, actions) in our lives to become healthier and more Christ-like. We’ve heard “it takes 21 days for a new habit to be created” but I want to debunk that theory and say that it takes as long as it takes for each of us to create new, healthy habits in our lives. It takes as long as it takes—until we go home to Christ—for us to be fully sanctified and look more like Christ and less like the world. Get going, take one step toward godliness and away from your natural desires, and see how God will empower and lead you each step of the way! Dawn has been involved in women’s ministry in both volunteer and staff positions for many years. 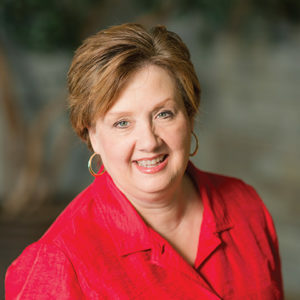 She is the Women’s Minister at The Church at Brook Hills, in Birmingham, Alabama. Her desire is to train, equip and encourage women to use their God given gifts and abilities to show Christ’s love and grace to our world. She graduated from the New Orleans Baptist Theological Seminary Women’s Ministry certificate program, has served on the Alabama Baptist State Women’s Ministry leadership team, and serves as a LifeWay Ministry Multiplier. She is a contributing author to Transformed Lives: Taking Women’s Ministry to the Next Level.